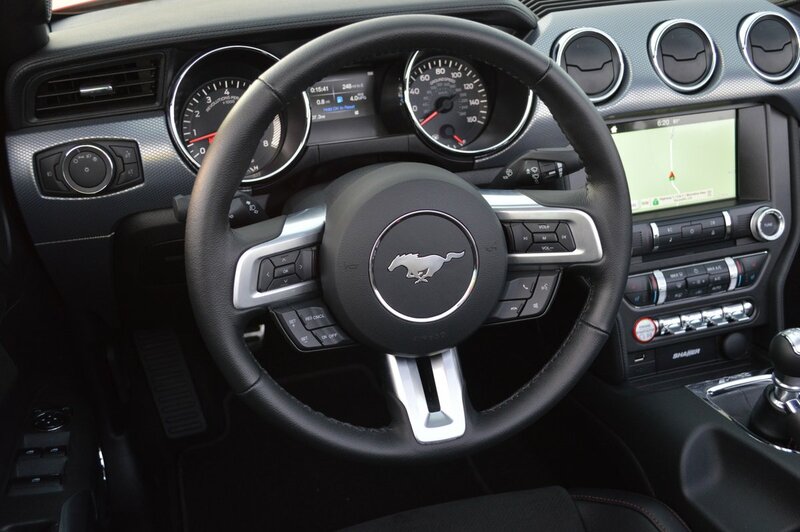 Gripes: Does a Steering Wheel really need 18 buttons? 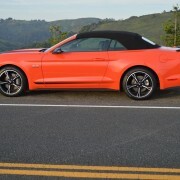 The latest offering in Ford’s rag top pony car line is a very endearing product. 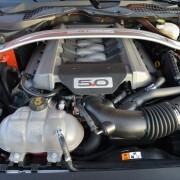 Hot Rodders will love it for its 435hp and bellowing exhaust note. Sun worshippers will give it high grades for its expansive tanning bed. 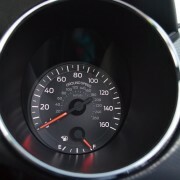 Back road carvers will grant it high marks for its handling dexterity. 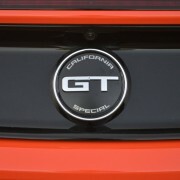 About the only souls predisposed to condemnation are mileage nerds who will look askance at the GT’s combined EPA rating of 19 MPG. 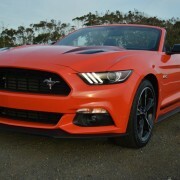 Believe me, that’s a small price to pay for the repetitive fun dividend this Ford provides every day. 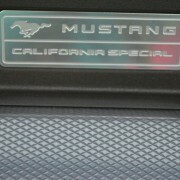 As has been the case since this model’s inception in 1964, there are pretend Mustangs and there are real Mustangs. 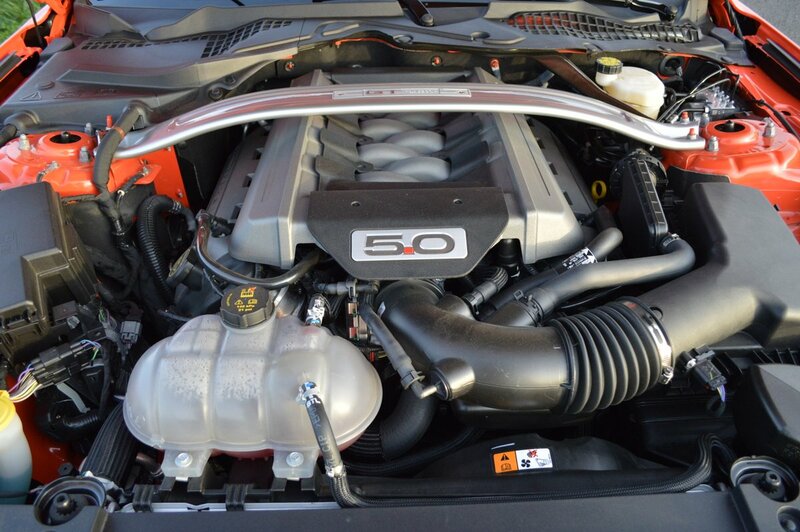 The pretend stallions are gelded at birth with just 6 cylinders under the hood. 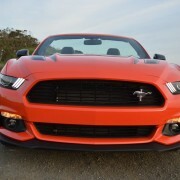 The real Mustangs come off the Flat Rock assembly line with a proper V8 in the engine bay. 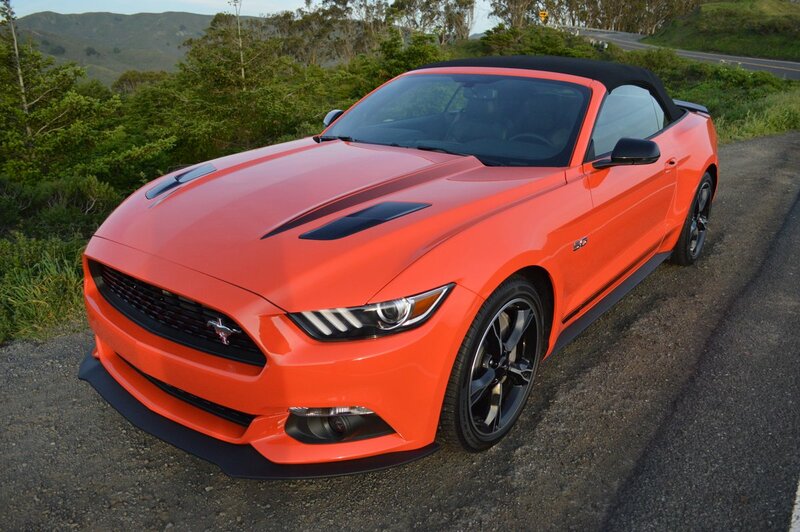 In the case of our Competition Orange test GT, proper refers to a 5.0 liter V8 massaged to produce 435hp and 400lb.-ft. of torque. The best of all drivertrains to harness this output is the 6-speed manual transmission, coupled to a 3.31:1 rear axle ratio, both of which are available at no extra cost. 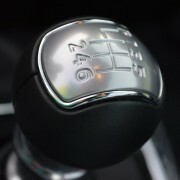 The manual shift is a work of art, from the incised pattern on its chromed knob to the lockout lift ring for reverse gear. The levers throws are ultra short and satisfying. The clutch pedal’s precise engagement makes slamming home shifts at redline a true driver’s delight. 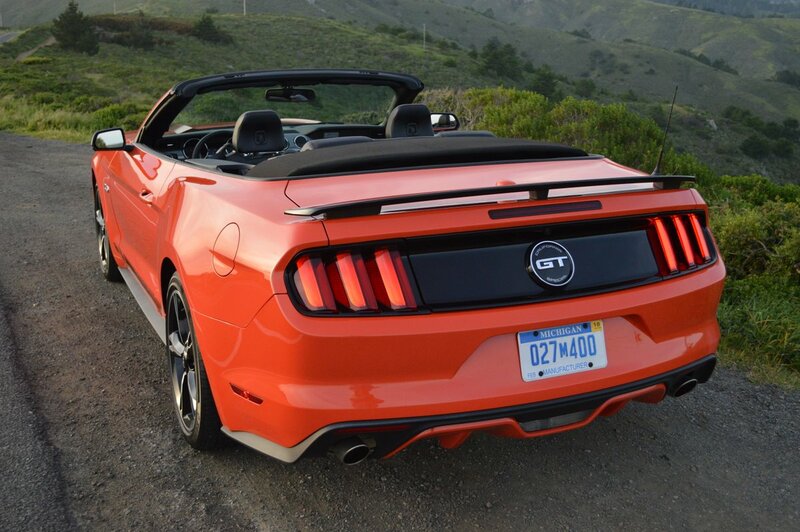 Enthusiasts will never run short of enthusiasm for driving this manual gearbox Mustang GT. 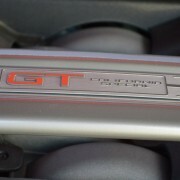 Unlike so many front-engine muscle cars, the GT does not disappoint when the occasion arises to tackle some curves. 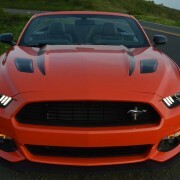 In that regard, Ford has done everything to make the Mustang a stellar handling pony car. Confidence in curves starts with the right underpinnings. 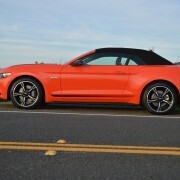 Here, Mustang was an early adopter of fully independent rear suspension to go along with independent front suspension. 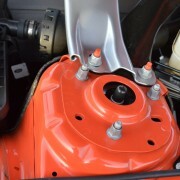 This pairing results in a balanced, controllable platform which is fine tuned by a stout front strut tower brace and a standard limited slip rear axle that prevents wheelspin. 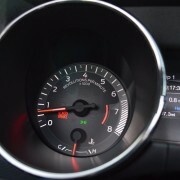 All GTs offer standard electronic line-lock for optimizing drag race starts, plus a bevy of “Mustang Tack Apps” that allow you to monitor g-forces, braking times, acceleration times in the quarter mile, as well as 0-60mph times. 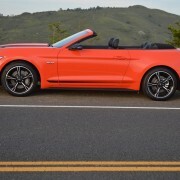 The convertible version of the GT is remarkably stiff. 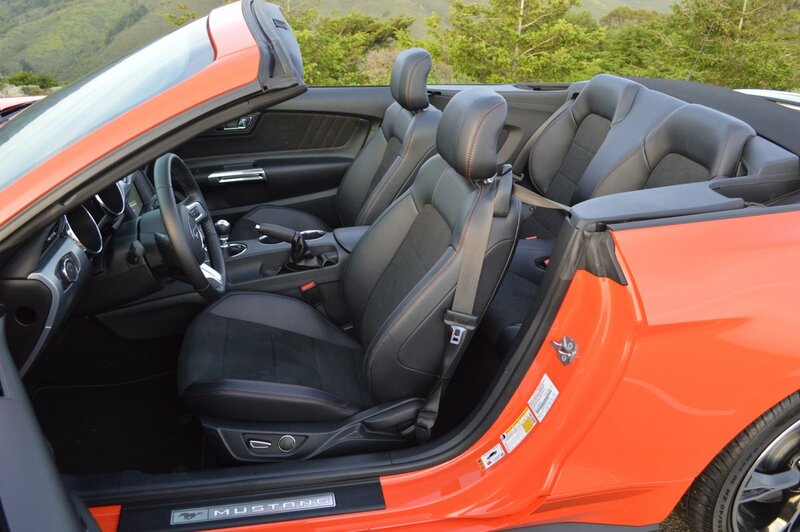 You will never sense the chassis flexing, even when traversing railroad tracks with the top down. And speaking of that top, it will fold itself into a neat covered receptacle in less than 10 seconds. 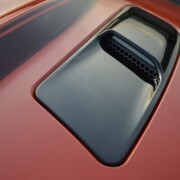 All you have to do is manually release a hefty T-shaped lock handle to disconnect the roof header from the windshield surround. Dropping the roof automatically lowers all four side windows. However, raising the roof requires you to elevate on your own those same side windows. 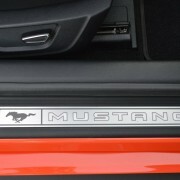 Ford has provided a sizeable glass rear window and equipped it with heating coils to keep it clear. 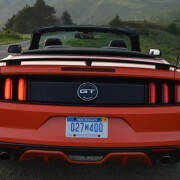 Even with the top raised, visibility to the rear and sides is surprisingly good considering the GT’s sleek proportions. 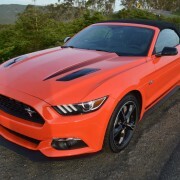 You will definitely want to order your convertible with the slick and relatively inexpensive “California Special Package” ($1,995) which pays tribute to a rare GT/CS Mustang Ford built in the late 1960s for California only. 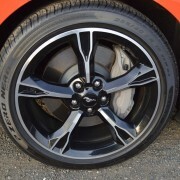 In today’s version of that Golden State look back, Ford supplies exceptionally handsome 19 inch painted and machined ebony alloy wheels which carry hefty Pirelli P Zero Nero rubber measuring 255/40R19 at each corner. 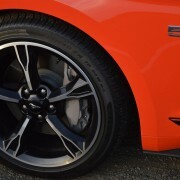 These wheels and tires alone would cost you twice the California Special Package surcharge were you to order the combo from your local tire store. 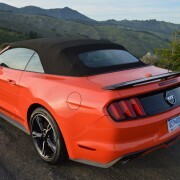 In addition to the sticky footprint, the package also includes a piano black tail spoiler, plus very handsome ebony accents on the hood and rockers that utilize decreasing size Ben Day dots to accentuate the Mustang’s swooping lines. The almost equally expensive “Shaker Pro Audio System” ($1,795) is an item I could live without. 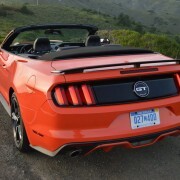 Since we spent most of our week with the top dropped, the Shaker’s 12 speaker system and huge trunk-mounted sub woofer was hard pressed to compete with the sound of rushing air. 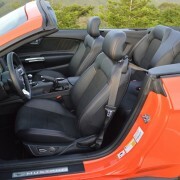 The GT Convertible includes very nice 3-stage heated front seats. 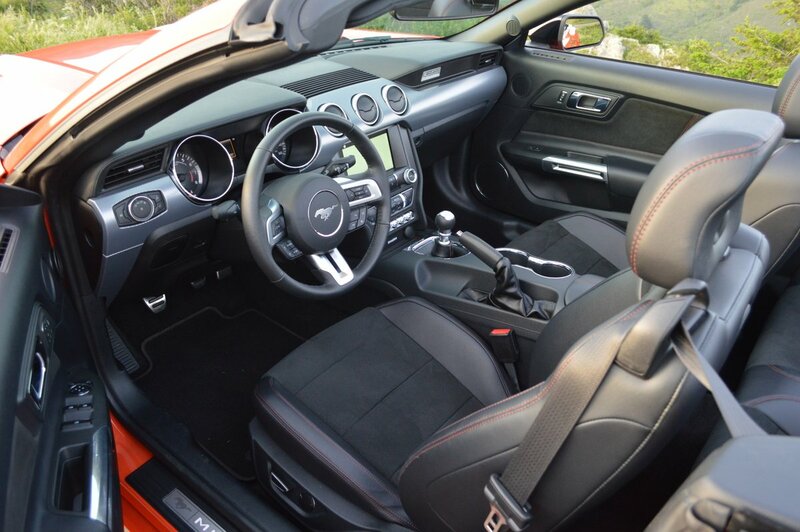 The interior is well laid out in terms of door design, low instrument panel height, and reach to the shift console. 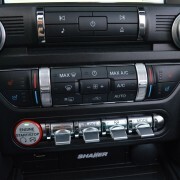 There’s a tad too much chrome on the auxiliary switch control panel located at the foot of the center stack. The HVAC blower switch is too small and difficult to activate. 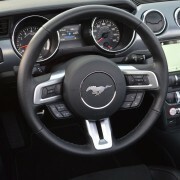 But all in all, the Mustang GT offers drivers the best interior design of any muscle car on the market today. 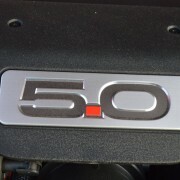 Be thankful you can still buy this much high performance for this little outlay today.